A couple of days ago I posted some layouts I did for a friend. Today she stop by to pick them up and look what she brought with her. Oh My Gosh!!! Apparently someone in her family was into card making and gave it up and I have been the lucky heir to their supplies. She told me that she still has two more boxes of stamps yet to bring over to me. Going through these stamps and ohhing and ahhing, I noticed that most of them are marked "Stamping Up" so I am considering myself one lucky gal. 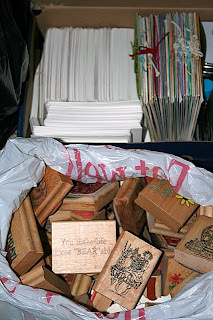 The shoebox is full of precut cards, card fronts ready for stamping, envelopes and stamp pads. 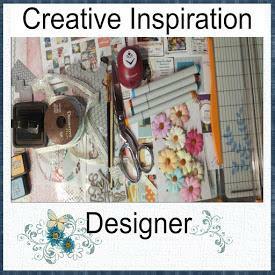 A challenge was issued at Lil Scrappers to create a card without using layers. In order to accomplish this and still have a layered look, I used patterened paper on the inside of the card and the cardstock on the front. Using a fancy edge so that the patterned paper showed through. Once in a while when I am scrapping Missi will come in and sit beside and chatter away to me. This is not a common occurrence but it seems she senses when I am not feeling the best. Last night was one of those times, actually she did it several times during the night. I was lucky enough to be able to catch her on one those times. 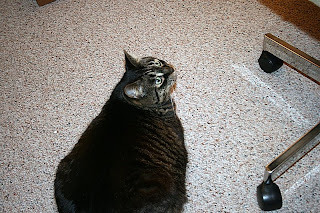 THAT was very rare as she usually runs as soon as anyone picks up the camera. I have been pushing myself to keep scrapping, sometimes through tears. I don't want to give in because I know if I do I will have lost the battle. So I am still plugging away on photos from the Lion Safari. Someday I will get through them LOL. Hey, I'm to the birds now! 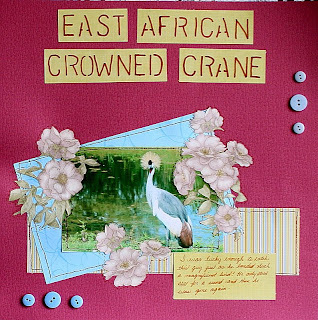 Here is the East African Crowned Crane, isn't this just a magnificient looking bird? Oh and I got my sewing machine to work! Praise the Lord! I put this machine away two years ago because the foot pedal would not work, no matter what I did it just would not power. Today I got it out thinking I would stop into the shop next week and see how much a replacement would cost... plugged it in and it worked fine. This gorgeous Bird of Prey is European Eagle Owl. 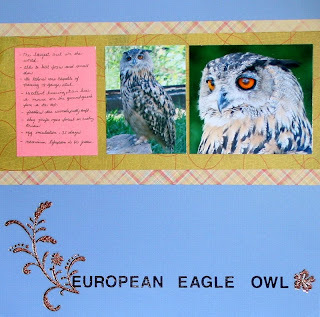 If you have been following my blog, you know by now that the owl is my favourite bird.. I think it has something to do with their eyes, and those cute little beaks. Can you imagine though, their talons can pierce through 18 gauge steel!!! WOW, I would not want to be caught in those things. WOW...look at all those stamps! 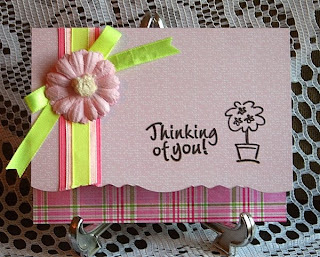 love the card you created over at lil scrappers..yummy! Miss talking to you lots Jackie! Big HUGS from me to you!! Wow! You really scored!! What a great stash! Love your card -- very pretty! What a great gift that was! I have some card-making questions to ask you but I'll save it for another time as I'm at work now. Great pages again - we saw the crowned bird at our zoo visit last week too!